As the winter hawk swoops in bringing chattering teeth and shivering bodies, looking out the window can unpleasant. It’s not just because of the arctic landscape we see out there, it’s also because the windows are darned cold! Your drafty windows are allowing the winter hawk to fly right into your living room. The property manager called me in late 2013 and explained that residents were complaining of drafty windows in the six 4-story buildings and energy bills were high. What could be done? 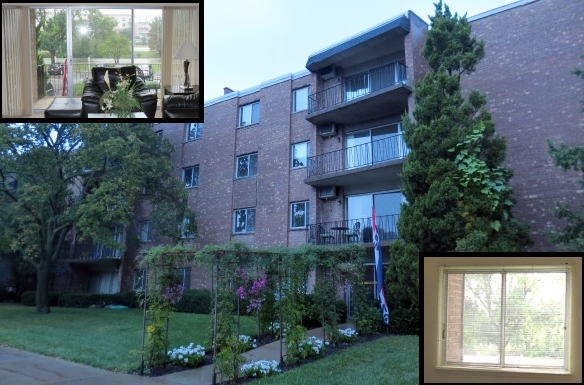 We replaced the weatherstripping on windows and sliding doors at this 200 unit apartment building last winter. As of this writing, we are completing a second building. 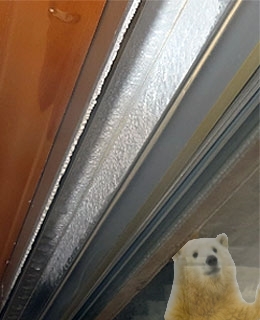 The original aluminum windows, circa late 1960’s were equipped with insulated glass but not thermal breaks in the frame. 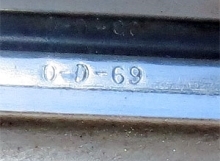 Date of 1969 is stamped in the metal insulating glass spacer. After so many years of service, the weatherstripping was worn and frayed. On cold, windy days it was tough to sit near the drafty windows. I evaluated the windows and sliding doors and found that, aside from being drafty and occasionally hard to slide, the windows were in good shape. Even the insulated glass had surprisingly few failures. 1. Air test on unimproved window. Perform air infiltration testing on one window and one sliding door in order to measure unimproved air infiltration. Air infiltration testing was performed at three test pressures. 2. Develop a repair procedure which would include weatherstripping replacement. I will discuss this further below. 3. Replace weatherstripping and perform other retrofits on the previously tested drafty window and sliding door. The results were in the range that we wanted. On the one hand, air infiltration was reduced from 42% to 79% depending upon the product and test pressure. The air performance at a 25 mph wind pressure (highlighted in yellow) was better than the rate acceptable for light commercial sliding products according to NAFS, the North American Fenestration Standard (.30 cfm/sf @ 1.56 psf). 5. If successful perform the full repair including replacing the weatherstripping on all the drafty windows and sliding doors, building by building. This did happen. After the sample repair and prove-out testing, we were authorized to proceed with the replacement of all windows and sliding doors in one of the 200 unit buildings, while it was occupied. We put a system and a team in place and the building was completed in about two months. This was in Fall of 2013. Now in Winter of 2014 we have nearly completed the second building. Selecting the proper weatherstripping is a bit of an art form. For sliding doors and windows, the challenge is to size the fuzzy “sweep” weatherstrippings correctly so that they block much of the draft but are loose enough to allow the sash to slide. 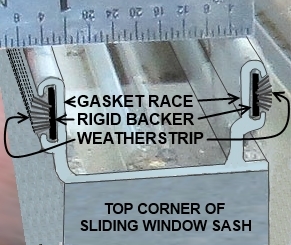 The replacement weatherstripping must also fit the existing “gasket race” which is a slot extruded into the frame and sash. 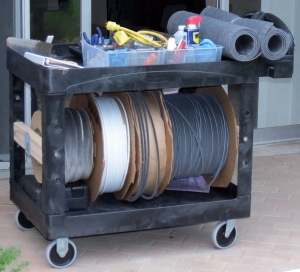 The gasket race holds the rigid backer of the weatherstripping firmly in place. The old weatherstripping must be removed, which can be a difficult and messy operation, then the new weatherstripping must be threaded into the gasket race. This is also not easy because the end of the race is not always open. It may be blocked by abuttting parts of the window. If the end of the gasket race is open and available, weatherstripping replacement is easier but the new weatherstrip might slide out of position over time. It must be “staked” in place. 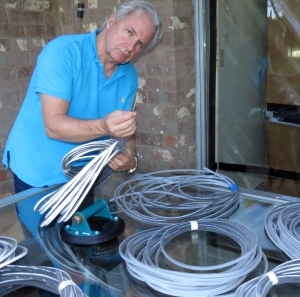 To successfully replace weatherstripping, training and experience is needed. We measured the sizes of the gasket races and ordered a selection of pile heights for trial and error cycles until we found a combination of weatherstrips that seemed to fill the gaps between sash and frame without unduly inhibiting sash travel. The final design involved three different weatherstrip products. With all window types, continuity of weatherstripping is essential. After you replace weatherstripping you may still have drafty windows if the weatherstrips don’t meet one another at the corners. This may sound easy, but on a sliding or hung window there are unavoidable gaps in weatherstrip continuity, especially at meeting rails, where something else is needed to bridge the gaps. A “dust plug” is needed. This is an oversized mutant weatherstrip that looks like a fuzzy pad with a sticky back. It must be sized to bridge between ends of weatherstrips and complete the weatherstrip continuity. We found that six dustplugs of varying sizes were needed. In order to get them to stick, we developed a special pretreatment that ensured adhesion. 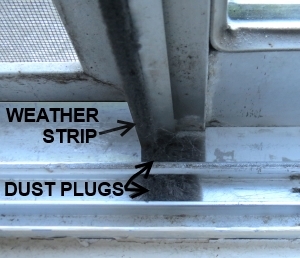 As with weatherstripping, the dust plug must be carefully selected to stop the drafts but still allow easy operation. Drafty windows: How much improvement do I want and need? Now we move beyond windows and into building envelope science. It is wise to resist the temptation to turn the building envelope into a giant plastic bag. Buildings need a certain amount of air exchange in order to provide fresh air and dissipate excessive moisture. You can find this concept littered across nearly all building codes under the heading “natural ventilation”. The codes usually state that the operable window area must equal or exceed 4% or 5% of the floor area. But since the windows are usually closed in the winter, the clear implication is that the operable windows leak air even when closed, and this leakage is the “natural ventilation” that is needed year round. When the windows are super tight, the concept of natural ventilation doesn’t work. If you have ever walked the halls of a smelly older apartment building, you will know what I mean. Also, when the windows are too tight, moisture has less of a chance to escape. Human habitation involves continually adding moisture into the air through cooking, bathing and respiration. Where will that moisture go? The last place we want it to go is inside the walls where it might condense on cold elements of the wall construction. This can easily happen in older buildings which tend to have no vapor barrier, and the dreaded M word can result (mold). Knowing these things, I was concerned that we might be too effective when we replace weatherstripping. 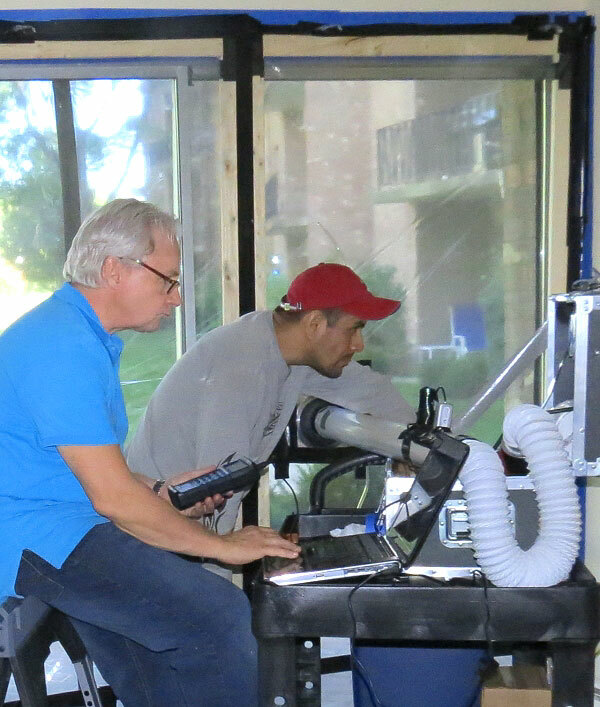 Through the testing and repair cycles I found that we could cut the drafts by about half, bringing the window and sliding door air infiltration performance into line with standards for new windows. This, we hoped, would reduce complaints of drafty windows while still allowing residents to breath easy. The strategy seems to have worked. 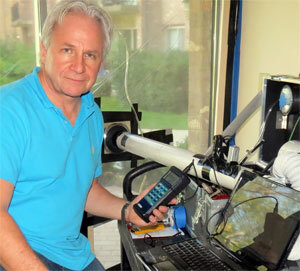 During the 2013-2014 winter of the notorious polar vortex, the very few complaints of drafty windows that were received were found to be one-off problems that were addressed on an individual basis. Energy consumption was surely reduced, but we don’t now how much because a boiler and controls were replaced at the same time as the weatherstripping replacement. We don’t know what energy improvement is attributable to what building improvement. My measure of success is this: We have been asked to replace weatherstripping on drafty windows in yet another building. The work is in progress. Something was done right! I have two 22×46 aluminum sliding glass windows whose sweep seals have worn out. I am confident that I can replace the seals if I can locate the right materials. I live in Los Angeles, the windows are in good condition including the aluminum frame. Thank you very much for your very informative article on weatherstripping older windows. This cost effective way to reduce air infiltration and thereby save money on heating and cooling costs seems to lack clear voices like yours with the industry push for replacement windows. We take chisels and grind the sides near the tip so it can ride in the gasket raceway and strip out the old weatherstripping. You can also adapt a hook tool for this purpose.